Shallow epicontinental seas and lakes covered a considerable area in Central Asia until the Neogene. Most of the area became dryland in the Miocene during the uplift of the mountains, although geological evidence shows that a relict brackish-water lake covering much of the Turkmenian lowlands and the Aral basin, existed. The lake is believed to have existed until the late Pliocene and became connected with the Caspian during the Akchagylian transgression (Nikolaev, 1965). The development of an arid climate in the region dates back to at least the early Pliocene when wind erosion, fostered by sparse vegetation, and the loose deposits created large basins which were occasionally occupied by pluvial lakes or sea water (Fedorovich, 1975). The rising mountains of the Pamir and Tien-Shan received ample rainfall, which fed large rivers. Their sediments were deposited in abundance in the foothills and on the plains. Consequently, an alluvial plain formed in the Miocene extending from the western Kyzylkum to northern Karakum. It consists of sand and clay about 80 m thick. The sedimentary composition suggests a fluvial origin from the ancient Amudarya. Other large rivers, which drained the northern and western Tien-Shan, also transported large volumes of alluvium and deposited fans (or inner deltas) in the foothills or reached some enclosed basins. Later, the northern Karakum experienced uplift and the area of alluviation shifted further south (Figure 2.6). 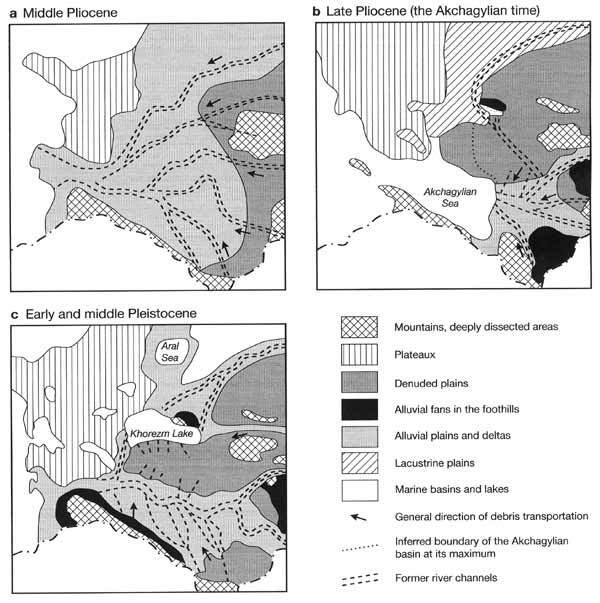 The time of the Akchagylian transgression of the Caspian in the late Pliocene featured an increase in moisture supply and lower evaporation. Rivers, originating in the mountains, reached closed basins on the plain and formed lakes. A complicated system of ancient Tertiary valleys exists in Central Kazakhstan where more than three generations of valleys were identified (Svarichevskaya and Kushev, 1975). A relatively high moisture supply was also typical of the Eopleistocene and the presence of water bodies in many depressions, which had been filled during the Akchagylian. One such lake existed in the Sarykamysh basin. It possibly received water from the Amudarya and was about 70-80 m above mean sea level (a.s.l.). Another lake was formed by the Syrdarya in the Mynbulak depression in the Kyzylkum. It has been established that isolated enclosed lakes existed in the deepest western trough of the Aral basin (Kes et al., 1993). The Pleistocene was marked by progressive aridization, which eliminated the perennial streams on the plains of Central Asia, and glaciers became the only source of runoff. The Amudarya (which was flowing westwards), Murgab, and Tedjen brought and deposited large volumes of sediment on the plain which accounted for the instability and frequent migrations of the channels. Fedorovich (1975) suggested that in the early Pleistocene a distributary of the Amudarya deviated to the north and flowed into the Sarykamysh basin through the Upper Uzboy. Other rivers, originating in the mountains, discharged into lakes, which were either long-term or periodically reappearing features. The Amudarya turned northward towards the Aral Sea at the end of the middle to the beginning of the late Pleistocene. This can be at least partly attributed to the fact that its former channel was completely blocked by alluvium (Markov, 1965). During the early and middle Pleistocene, the Syrdarya migrated across the northern Kyzulkum west of its modern channel. During the Khazar transgression of the Caspian Sea, presumably marked by higher rainfall, the river formed extensive though shallow lakes centred at about 46°N, 68°W where the Chu and the Sarysu rivers joined it. In the late Pleistocene and the Holocene, the Amudarya valley was stable in the middle course while in the lower reaches it was constantly migrating. The river mouth moved from the Aral basin to the Sarykamysh and back. As a result, three deltas were formed: the first, located east of the present mouth, the second at the Sarykamysh, and a third between both. When the river discharged into the Sarykamysh, the lake overflowed and the water surplus discharged through the Uzboy (Fedorovich, 1975; Kes et al, 1993). The Amudarya repeatedly emptied into the Sarykamysh, the last such event being about 800 years ago.